The Museum in its current form was started in the year 1857. It owes its origin to the joint efforts of J.A. Brown, then Director of the Trivandrum Observatory and General William Cullen, then British Resident. The Government approved of Brown's idea of starting a Museum in a part of his Bungalow. In order to place the Museum on stronger and more satisfactory basis a society was organized in 1855 with Sri Uthram Thirunal the Maharaja of Travancore as Patron, the British Resident General Cullen as President, the Elaya Raja as Vice-President and Mr. Brown as Secretary of the Society and Director of Museum. Its objective was to afford instruction and encouragement in arts and crafts by the exhibition of specimens of interest in natural history and products of art and industry, indigenous and foreign. In 1872, Lord Napier sent Robert Fellowes Chisholm, Architect to the Government of Madras to Travancore to design a museum. It was against the preference of officials (who wanted the classical style for the new building) that Chisholm attempted to promote native art in architecture. He found himself in incongruous position of having to instruct erudite Travancore elite on how best to foster and extend their own art. In the short space of a few months, Chisholm thoroughly acquainted himself with all that had been done in an Architectural way, both by Europeans and natives. His extremely idiosyncratic design for the Museum was based on a very beautiful form of domestic art. 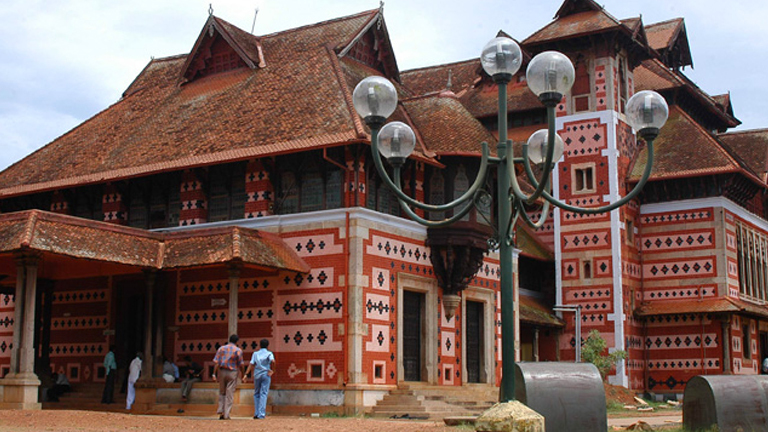 In 1880 the new building designed by Chisholm, and named after Lord Napier, then Governor of Madras, was occupied. The building is of considerable architectural beauty. Three big halls connected by long corridors of panes and artistically painted walls, both inside and outside, constitute the main scheme of the building. The museum has a fairly good collection of exhibits that counts to above 550 numbers. These collections constitute mainly of metal sculptures of Chola, Chera, Vijayanagara and Naik styles which belongs to eighth to eighteenth Century AD. A wonderful collection of wooden sculptures and carvings make another attraction. Stone sculptures of different styles of South India and exquisite collection of ivory times along with musical instruments adds to its fabulous collection. Ancient coins, pre historic burial urns, replicas of Harappan civilisation and other royal collectibles also form part of this mammoth collection of exhibits. Wooden ornamental box, temple chariot, different types of ceremonial lamps also are the major attraction. Bronze Images: Image making appears to have been practiced in Kerala from very early times. The art is supposed to have drawn inspiration from the existing religious faith of the people. The conception of Siva, Vishnu, Parvathy and Lekshmi in several forms has been given shape in beautiful image of bronze and occasionally copper whose iconographical details are modeled based on rules laid in the 'Silpashastras'. The art of making metal idols in Kerala dates back to 8th Century AD. The 'Matsyapurana' (ascribes to 450 AD) contains vivid descriptions on the method of casting bronze. Wood Carvings: Wood carvings in Kerala temples show the art at its best in the same as the stone sculptures. The most common of wood carvings are seen on 'Namaskara mandapas'. They depict figures of 'Navagrahas' on ceiling and puranic figures on rafters and beams. The `Koothambalams` are also noted for their fabulous wood sculptures. The wood used for making wood carvings ‘Kumble’ wood which is very soft and easy to carve. The main attraction of wood carvings in this gallery are temple car, the royal dressing table, a multi chambered jewellery box etc. Ivory Carvings: The art of Ivory carving has long been practiced in India. The ivory carvings are purely a manual work and is practiced by Artisans with simplest of tools like knife and chisels. The ivory carvers shape and create articles of exquisite beauty and delicacy from splendid structures of Gods and goddesses of the Hindu pantheon to simple utilities items. The exhibits in ivory on display are new designs evolved by the design center of Industry Department for commercial production. The concentric ball, Krishna and Radha, Lekshmi and Siva-Parvathy are the excellent hand works displayed. Stone Sculptures: The temples of Kerala are the store house of exquisite stone sculptures which exhibit diverse influences of Chera, Chola, Pallava, Pandya and Vijayanagara empires. The figures of deities are among the typical specimens of temple sculpture. The earliest specimens of Kerala stone sculptures date back to the 8th Century AD. Stone was the most preferred materials for these works of artistic brilliance due to its nature of perseverance. The museum collection includes 2nd century 'Gandhara' sculpture to 18th century Kerala sculptures. Coins: Coins are as important as the inscription in history. The inscription on the coin indicates territory over which the rulers ruled. The study of ancient and medieval Indian coins brought to light the names of many kings about whose existence there was no literary or inscriptional evidence. Napier Museum, has a rich collection of ancient, medieval and modern South Indian Coins, of which Satvahana coins, Chera coins, Chola coins and Vijayanagara coins are the most Important. Apart from the Indian coins, there is a representative collection of foreign coinage which includes Roman, Danish, Persian, Chinese, Turkey and Dutch coins. In the Napier Museum there is a good collection of 5480 coins coming under 9 major categories. The sword, the precious heirloom of Velu Thampi Dhalawa was presented to the then Raja of Kilimanoor Palace, on his military expedition to Mannadi. Later it was handed over to the first President of India Dr. Rajendra Prasad in August 1957. The Sword was kept in National Museum, New Delhi until it was handed over to the Government of Kerala on 20th June 2010 and presently displayed in this gallery. Velu Thampi Dhalawa (1765 - 1809), one of the first martyrs of Indian Freedom struggle, born in the village of Kalkulam at Thalakulam, he was the Dhalawa (Prime Minister) of the erstwhile Kingdom of Travancore from 1802 to 1809 during the reign of Maharaja Bala Rama Varma. The Indo-Saracenic was an architectural style movement by British architects in the late 19th century in British India. It drew elements from native Indo-Islamic and Indian architecture, and combined it with the Gothic revival and Neo-Classical styles favoured in Victorian era. The cost involved in the construction of buildings of this style was high, including all their inherent customization, ornament and minute decoration, the artisans' ingenuous skills (stone and wood carving, as well as the exquisite lapidary/inlaid work) and usual accessibility to requisite raw materials, hence the style was executed only on buildings of a grand scale. Such buildings have grown more valuable and highly prized by local and foreign populations for their exuberant beauty today.